Did that title make you shudder? No, its not time to start planning for the holidays - for gosh sakes, I've barely gotten a tan this summer! But in the media world, the holidays are in full swing. Magazines and other publications are starting to put together their winter issues so many brands are now hosting holiday previews of the products you'll be seeing in stores later this year. I've been invited to a few of these previews lately so thought I would give you a sneak peek and some of my hot (cold?) picks for the season. For their preview, The Home Depot overtook my favourite and the prettiest bakery in the city, Bobbette & Belle (its where I bought Chloe's birthday cake!) and transformed it into a winter wonderland. The room smelled of cinnamon and we spent the morning noshing on artisinal hot chocolate and macarons while hearing about the newest decor collections and decorating tips. The Arctic collection with its icy blues and silvers was my favourite style. I liked how they featured items in multiples, like the silver penguins and nutcrackers on the shelf, to give them prominence. The mini silver ball wreaths on the tree are definitely on my wish list. I loved the fresh jewel tones of the Midnight Holiday collection. 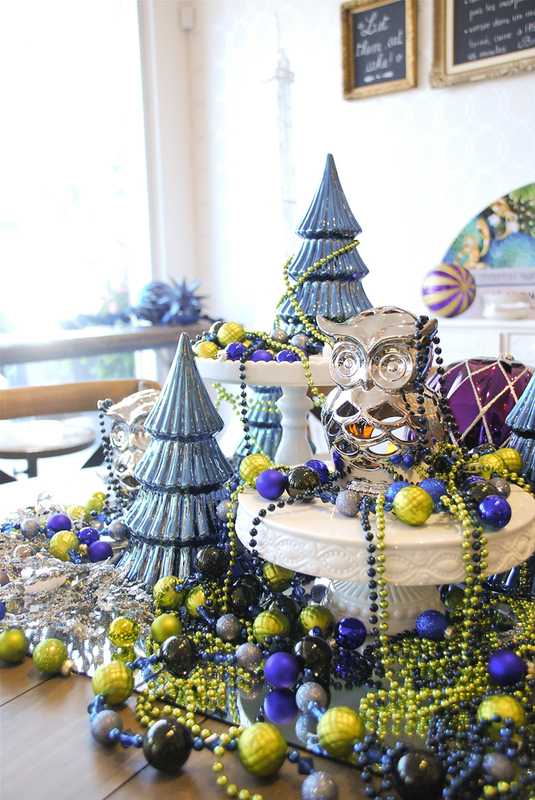 The mini round ornaments are actually strung together on the bead garland. What an easy way to add some texture and interesting shapes to your tree! I love the way the product was displayed in the store - tucked amongst the existing decor and working it in a casual way. You don't need to be "fussy" with your decor... just pile it in a basket or glass jars and it works! 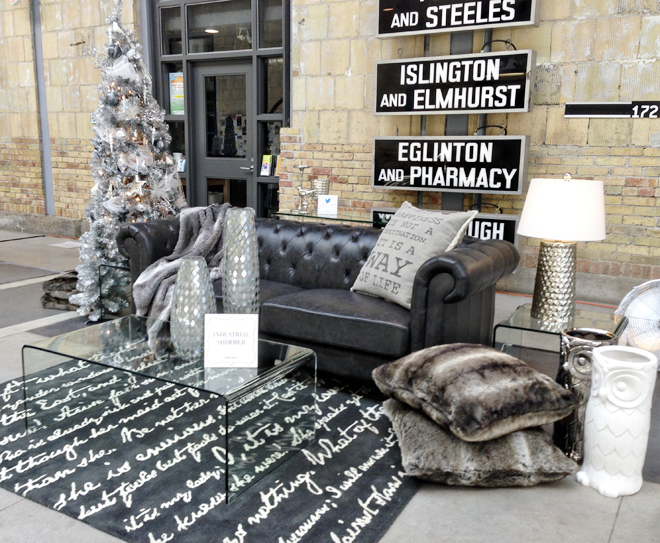 Urban Barn set up a grand preview space at Wychwood Barns. 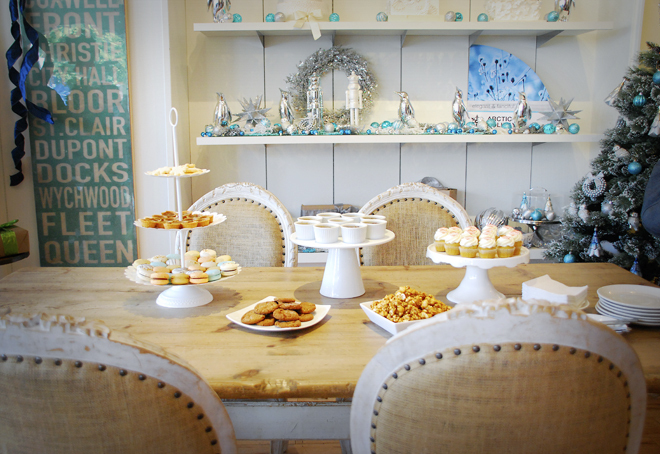 I was given a tour of their expansive furniture offerings, home accents, and seasonal decor items. The Industrial Shimmer collection really caught my eye. I loved the tufted Fillmore Sofa which is actually a polyurethane upholstery in a smoky grey. Even though it was a billion degrees outside, I was ready to jump into the Lakehouse Retreat bed. I'm loving the washed gray finish of these pieces. 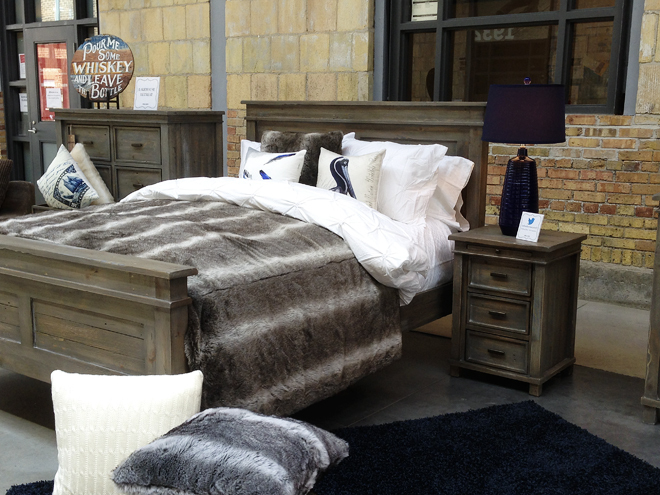 Faux fur is a big trend for holiday and I thought the striped chinchilla pattern on this bedspread was interesting. So many great products are coming your way at Canada's largest department store. If you are a fan of the classic Bay stripes, you won't be disappointed. 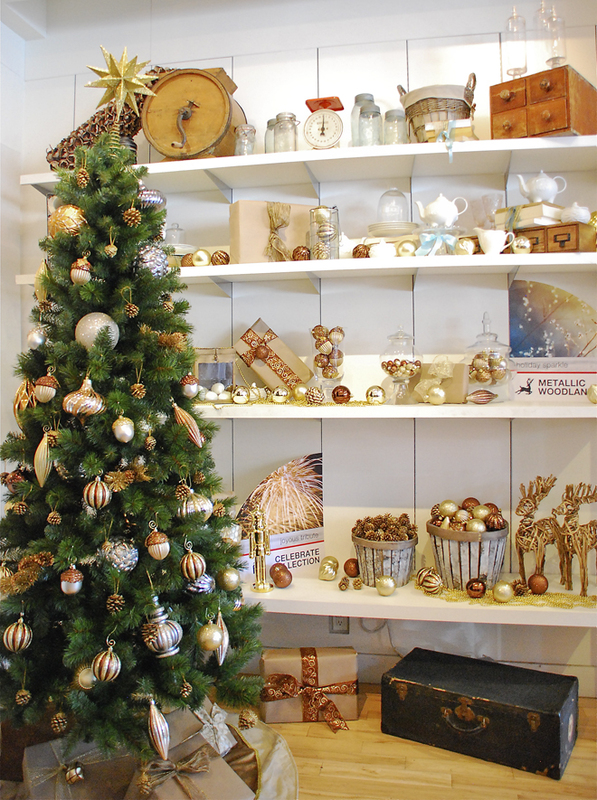 You'll find stripes on everything from ottomans and pillows, board games and shoes, to sweaters and the classic nutcracker. Hudson's Bay will be creating "one stop gift shop" concepts in their stores offering curated collections of the coolest gifts. 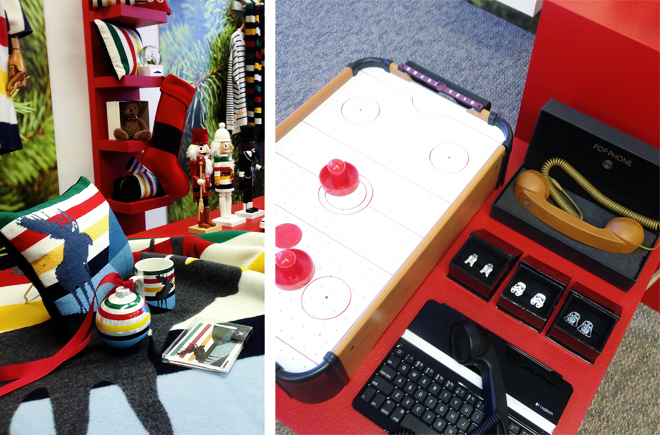 I thought the miniature air hockey table and Star Wars cufflinks were particularly fun. For tech lovers, they have awesome gadgets like hand-crank phone chargers and projectors that attach to your iPhone (movie night!) and for kids, they're bringing in a large selection of wooden toys. Shopping couldn't be any easier! If you want to see more of the newest items for holiday 2013, visit my Facebook page where I've loaded the behind the scenes photos I took at these media previews. Ok, enough Christmas talk. Back to sipping slushy drinks and basking in the sun!